Below are all of the Yellow & Orange dining chairs from our full selection of seating. All of the Yellow & Orange dining chairs are chosen from our Fabric, Leather, and Wood catalogues. If you need any help regarding any of our Dining chairs feel free to contact one of our team. All of our Yellow and Orange Dining chairs come with a quality Guarantee and are delivered free of charge Nationwide. 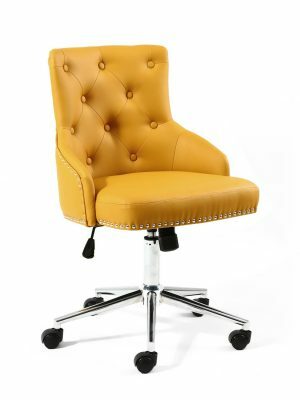 The Brent Yellow Faux Leather Office chair is a fully adjustable office chair styled in a traditional Chesterfield inspired button back design, and upholstered in an eye catching on trend Yellow faux leather material. The Seat itself is padded with high density foam for a very comfortable sit, and the quality upholstery is hand laid and buttoned, and finished with attractive chrome stud work around the edges. For Full Description and Sizes please see below. The Camberwell Yellow Linen fabric dining chair is a well designed and generously sized accent dining chair in a stylish Yellow linen upholstery. The attractive linen is very hard wearing and thick to touch, designed for both Looks and durability. For full description and sizes please see below.